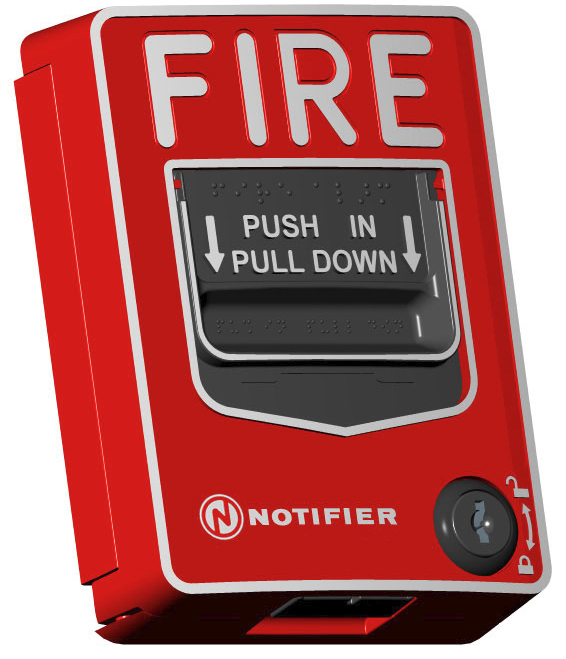 The Notifier NBG-12LX is a state-of-the-art, dual-action (i.e., requires two motions to activate the station) pull station that includes an addressable interface for any Notifier intelligent control panel except FireWarden series panels, and the NSP-25 panel. 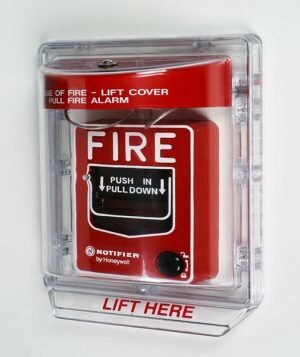 The Notifier NBG-12LX is a state-of-the-art, dual-action (i.e., requires two motions to activate the station) pull station that includes an addressable interface for any Notifier intelligent control panel except FireWarden series panels, and the NSP-25 panel. Because the NBG-12LX is addressable, the control panel can display the exact location of the activated manual station. 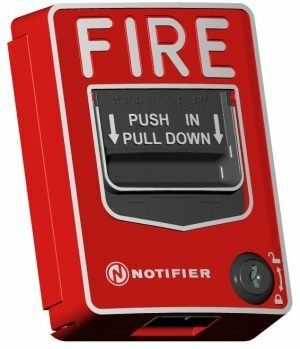 This leads fire personnel quickly to the location of the alarm. Pushing in, then pulling down on the handle causes it to latch in the down/activated position. Once latched, the word “ACTIVATED” (in bright yellow) appears at the top of the handle, while a portion of the handle protrudes from the bottom of the station. To reset the station, simply unlock the station with the key and pull the door open. This action resets the handle; closing the door automatically resets the switch. Each manual station, on command from the control panel, sends data to the panel representing the state of the manual switch. Two rotary decimal switches allow address settings (1 – 159 on FlashScan systems, 1 – 99 on CLIP systems). 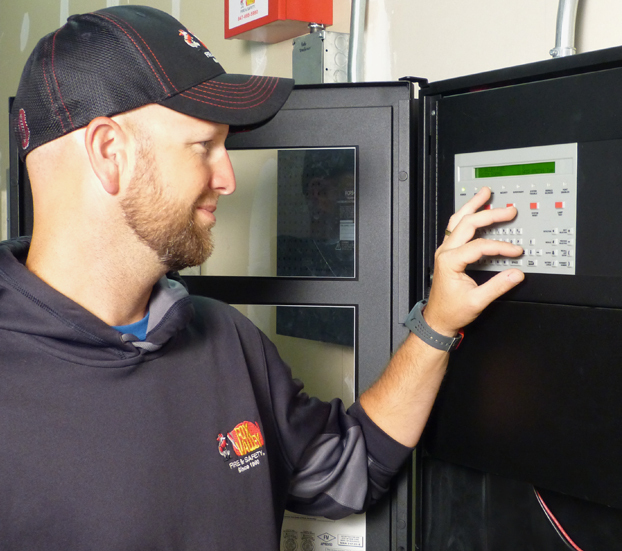 Maintenance personnel can open station for inspection and address setting without causing an alarm condition. Built-in bicolor LED, which is visible through the handle of the station, flashes in normal operation and latches steady red when in alarm. Handle latches in down position and the word “ACTIVATED” appears to clearly indicate the station has been operated. Captive screw terminals wire-ready for easy connection to SLC loop (accepts up to 12 AWG/3.25 mm² wire). Can be surface mounted (with SB-10 or SB-I/O) or semi-flush mounted. Semi-flush mount to a standard single-gang, double-gang, or 4″ (10.16 cm) square electrical box. Meets ADAAG controls and operating mechanisms guidelines (Section 4.1.3); meets ADA requirement for 5 lb. maximum activation force. Attractive shape and textured finish. Includes Braille text on station handle. Up to 99 NBG-12LX stations per loop on CLIP protocol loops. Up to 159 NBG-12LX stations per loop on FlashScan protocol loops. Dual-color LED blinks green to indicate normal on FlashScan systems.